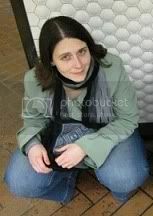 I enjoyed writing my first WIAW post a few weeks ago, so here is another! I’m not used to taking a picture of every single thing I eat and I forgot to snap one of breakfast, but it was a green smoothie with almond milk, pineapple, banana, Vega One natural flavor, and baby kale. 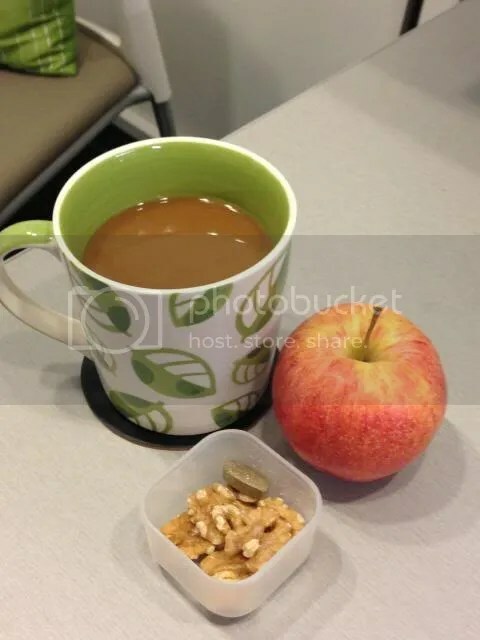 Morning snack was an apple, walnuts, and coffee with coconut creamer. Lunch was leftovers of what I’m calling Creamy Tahini Zucchini Soup. 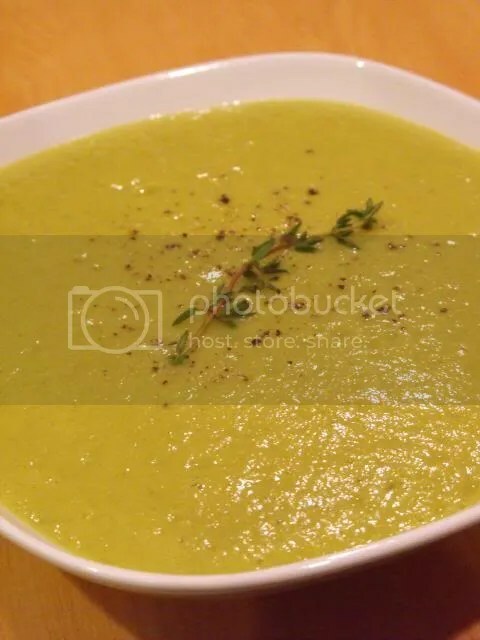 I simmered a sliced leek, five chopped zucchini, two smashed garlic cloves and a few twigs of fresh time in vegetable broth until soft, then blended the mixture with a drained can of chickpeas, a Tablespoon of tahini, smoked sea salt, and white pepper. I’ve been putting tahini in/on everything lately. 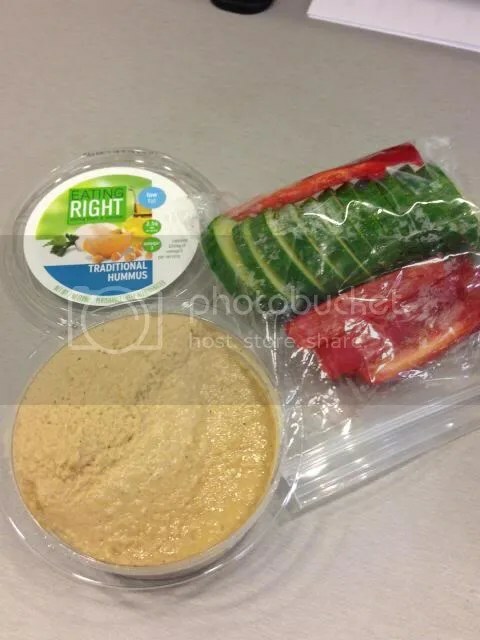 My afternoon snack was the standard veggies and hummus, this time Eating Right brand from Safeway, since that’s where I grabbed groceries over the weekend. I liked the hummus, it wasn’t heavily oily and had lots of good flavor from cumin and lemon juice. 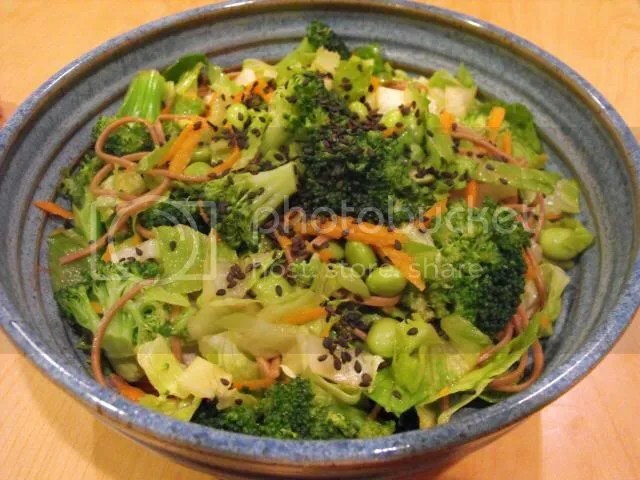 I whipped up dinner from what I could find in the fridge and pantry – soba noodle and broccoli salad with edamame and sesame lime dressing. I chopped two stalks of broccoli then got a pot of water boiling while I whisked together a dressing of soy sauce, rice vinegar, toasted sesame oil, lime juice, agave nectar, sriracha, and ground garlic and ginger. The soba noodles only needed to boil for three minutes, so I also threw the broccoli in there to blanch. Soon as the noodles and broccoli were ready I drained them and rinsed under cool water, and tossed into the dressing. Then I added some shredded romaine and carrot, mixed well, and topped with black sesame seeds. It wasn’t the most amazing meal ever, but for something I pulled together in under thirty minutes it did the trick!